Unity Candle Lighting–Two flames representing the individuals are joined to light a center candle. Each person lights a single taper candle. The couple then brings the flames together to light a larger middle candle. The tapers remain lit and are replaced in their holders to represent two coming together while maintaining individuality. Although this is frequently considered a Christian tradition, this is often chosen in interfaith ceremonies as well. Can be done with just the couple or including other family members and children. The Blessing of the Rings-The wedding ring is the visible sign of an inward bond which unites two loyal hearts in endless love. It is a seal of the vows made to one another. It symbolizes living together in unity, love and happiness for the rest of their lives. 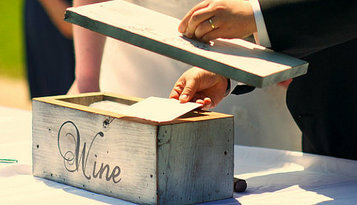 Blessing Cup/Kiddush– Partners share drinks from a single glass of wine. This symbolizes drinking from the cup of life and sharing all of its experiences together, both bitter and sweet. Materials: Glass of wine (a variety of the couple’s choosing) and table for it to sit on. Rose Ceremony– The couple exchanges two red roses, an act representing the first gift of love to one another. The wording asks that the couple pick a place in their home for roses so that you can take roses there to mark this most wonderful day. Often include roses to mothers or both parents. Thanks to The Parents - A wonderful way to acknowledge the love and support of your parents leading up to this day! Smudging– More commonly done in nature/wiccan/pagan ceremonies. The officiant will light the sage or smudge stick, waving it around the couple from head to toe, front to back, to cleanse the area of negative energies. Jumping the Broom– Comes from an African American tradition. At the end of the ceremony a broom is placed down on the floor of in front of the couple. They join hands and jump over together, their first act together in marriage. Breaking the Glass– A Jewish tradition that is now often seen in many interfaith ceremonies, as a non-denominational symbol. At the very end of the ceremony the groom breaks a glass. It symbolizes the shattering of the old and the bringing in of the new. Materials: Small drinking glass wrapped in a cloth napkin. Many other ideas from interfaith and cultural traditions!